Last time, we took a look at the X2Ts, a pair of small, budget Bluetooth earphones. Now, we’re going on the opposite end with the Mixcder E9. The Mixcder E9 headphones are sitting a little bit closer to the mid-range price point and they’ve got an over-ear design instead of the in-ear bud design that many people frankly dislike. Let’s take a look at them. First of all, let’s get one thing out of the way. These headphones are NOT on the budget range. There are so many reviewers out there who are referring to these headphones as if they cost nothing and should be treated as such. At this moment, you can get the Mixcder E9 for about $80 – give or take; depending on when and where you’ll buy them. For 80 bucks, you can easily get an entry-level smartphone. So, yeah. With that being said, we’re going to be treating these headphones as a mid-range product. They are a great value compared to the alternatives – but that’s a different thing. When opening the box, you’ll find an airplane adapter, the carry case which comes in handy when moving around, a USB cable for charging, and a 3.5 mm cable for wired connectivity – if you own a phone with a headphone jack. Those are foldable headphones which is great if portability is on your list. The over-ear design is something that you either love or hate. We often prefer the over-ear design over earbuds because it feels more comfortable and it’s great for noise isolation. But, again, it’s a matter of personal preference. The headphones are fully black and that gives them a serious and mature look – if that makes sense. On the weight aspect, we found out that that they are extremely lightweight at 255 grams. Considering that they are wireless headphones with batteries in them, that is rather impressive. Furthermore, one thing that immediately stands out is the build quality. It feels very solid and looks like a premium option. If you were to give us a blind test to tell the difference between the Mixcder E9 and a $300 choice based on looks alone, we’d be hard pressed to tell the difference. The interface is nothing too fancy. But, it’s extremely utilitarian. We’ve got two volume buttons: one for turning up the volume and another one for decreasing it. Also, there is an active noise cancelation button which allows you to turn noise cancelation On and Off at will. Speaking of noise cancelation, that’s a very handy feature which is almost a must-have while you’re outside. And if you don’t know about it, well, noise cancelation uses a sort of build-in mic in order to listen on outside noises and produces an out of phase sound which you can’t actually hear. That cancels or reduces outside noises. That’s the simple version. This is very important. Noise cancelation in combination with noise isolation allows you to listen to your favorite music without maxing out the volume and potentially damaging your hearing. Do keep in mind that noise cancelation is only supposed to cancel the ambient surrounding sounds. So, you may still be able to hear things like horns. And if for some reason you don’t like noise cancelation, again, you can turn it off with the press of a button. Our first small complaint is with the noise cancellation button. There’s a small LED that lights up when you turn it On and it stays like that even when the headphones are turned Off. Is this draining the battery? 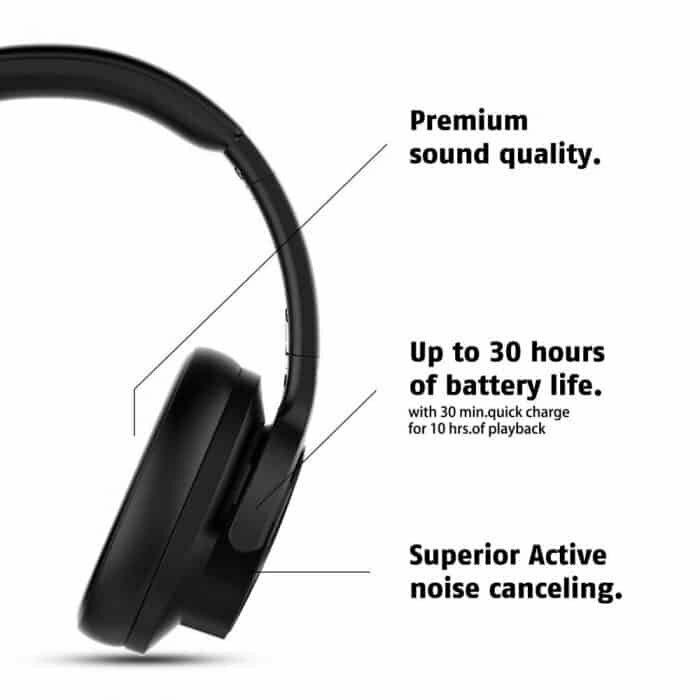 Is noise cancellation always active even when you’re not actually using the headphones? We don’t know and we honestly wish that everything would power off when not using the Mixcder E9. With that being said, though, simply turning off that button when not using the headphones is not a big deal either. So, meh. Battery life is one of the huge advantages that big over-ear headphones have over the small ear-buds. While wireless ear-buds typically give you 2-10 hours of wireless usage, you can get up to 30 hours with the Mixcder E9. Quick charging capabilities allow you to get up to 10 hours of usage with only 30 minutes of charging. That in combination with the foldable design makes these headphones suitable for traveling without sacrificing audio quality and comfiness. Fully charging these headphones takes about two and a half hours. Not a big deal. Especially if you consider that you get up to 30 hours of battery life. Frankly speaking, chances are that your average person will forget that these headphones need to be charged. And if all of that sounds nice, wait until you read the best part. If you’re one of those people who just refuse to get rid of the 3.5 mm cable, you’ll be glad to know that you can get up to 80 hours of use with a wired connection. That’s with noise cancelation being active. So, we suppose that you’ll get even more time if you’ve got it disabled. That’s another advantage that over-ear headphones have over ear-buds. Audio fidelity, bass response, and comfiness is often superior and we can definitely see that here with the Mixcder E9. These headphones come equipped with 40 MM drivers which is just about the right size to offer a good bass response. But, also small enough so that you’ll be able to easily take them with you. That being said, if you’re not satisfied with the bass response, or if you think that it’s a bit too strong for you, there’s always the choice of using a media player with a built-in EQ like Poweramp. Now, increasing the bass by using software is probably something that will slightly reduce your battery life. But, with 30 hours of usage, chances are that you won’t really have to worry. While we’re at this topic, we also want to mention that they are not only good for listening to music, but also for gaming. With that being said, we’d recommend going wired when gaming just to eliminate that tiny bit of delay that Bluetooth has. Comfiness is also great. The ear-cups feel very smooth and the headphones rest on your head without feeling heavy. Most importantly, you don’t get that squeezing feeling. The headphones rest on your head without really putting a lot of pressure on your head and ears. But, don’t let that fool you from the fact that the Mixcder E9 is also a good choice for running. Sure, you wouldn’t want to perform any extreme sports while wearing them as there is a slight risk of them falling over. But, if you want to go for a little run, then they are absolutely great for that. Compared to what we’ve looked at before, the Mixcder E9 is definitely a bit more on the pricier range. However, it proves that it’s worth the extra money with its superior sound quality, battery life, and comfiness. Not to mention that it’s a greatly underrated brand which deserves more recognition. We can’t vouch for their endurance. But, if you treat them right, chances are that these headphones will last for quite a long time. There is no water resistance rating. So, do keep that in mind. Also, don’t forget that if you sign up on their website, for a limited time, you get a 20% off coupon.